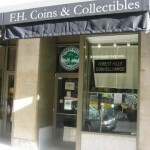 There are dozens of coin shops located throughout New York City. With trust and reputation so important in this industry, it can be difficult for coin collectors and precious metal investors to know who to turn to in the Big Apple. This is equally true whether you’re buying or selling, are looking for a coin shop to stop in while vacationing in New York, or plan to become a regular customer. 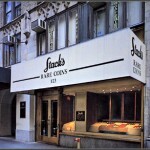 As with the majority of coin dealers located in New York City, Stack’s Bowers is a very high end coin broker. Perhaps the best-known New York City coin shop, S&B is widely recognized for carrying only top-end coins, and is truly in a league of its own. Although most of the pieces here are well outside the price range of casual investors or coin collectors, the store remains popular with tourists and those wishing to marvel at the best of the best. The store has recently installed a GOLD to go™ ATM, which offers immediate purchase of a variety of gold and silver coins and bars ranging from five grams to one ounce. F.H. Coins represents all of the best reasons to buy from a local NYC coin shop. This is a family-owned and operated coin shop with more than 50 years of experience in numismatics. 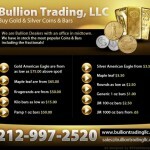 The company buys and sells gold bullion and rare coins, and provides free appraisals. Visit F.H. Coins for attentive service with a personal approach. The company has two locations, one in New York City and one in Queens, New York. As the name suggests, Bullion Trading LLC specializes in the buying and selling of gold and silver bullion, bars, and coins. Of the top NYC coin dealers, Bullion Trading focuses less on rare or antique coins and more on precious metals as an investment. As the largest seller of precious metals in New York, Bullion Trading LLC does business in person as well as online and through the mail. American Coin & Stamp Co. While not in New York City proper, many coin buyers and sellers find that they get better deals by going a bit outside NYC, where rents are lower and coin dealers can afford to sell for lower premiums. 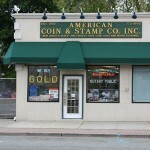 If you’re looking for a coin shop near New York, consider American Coin & Stamp Co. Located less than 20 miles from the city, American Coin & Stamp Co., Inc. is New Jersey’s biggest and oldest dealer of rare coins, gold, and silver. The company buys and sells gold and silver bullion, coin collections, and U.S. coins including silver dollars, halves, and quarters.